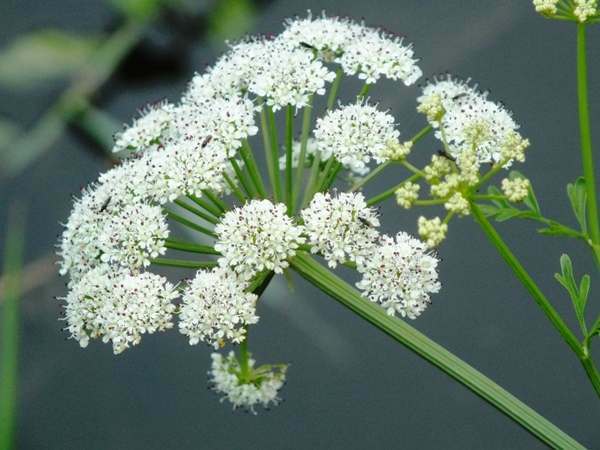 Hemlock Water-dropwort is a hairless perennial umbelifer and can sometimes reach shoulder height but more typicaly attains a height on 0.8 to 1 metre. 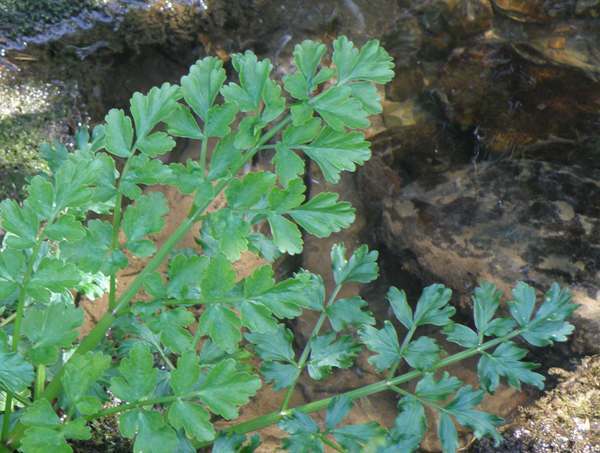 Because it is such a poisonous plant, the stems should not be used for making peashooters. 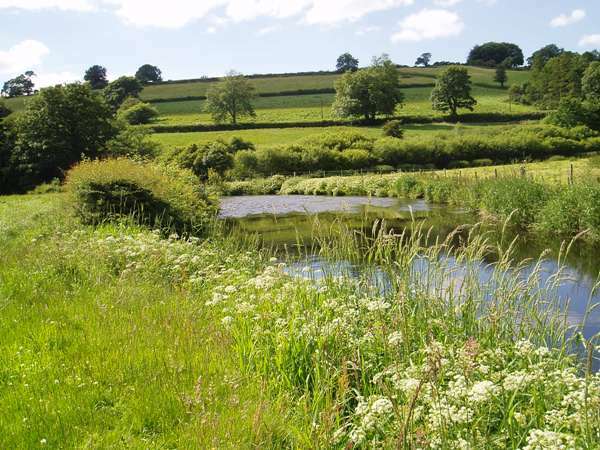 All parts of this fast-growing plant of wetlands and river margins are poisonous. Aklthough only very rarely eaten by people (and then causing severe sickness and sometimes fits; even fatalities are reported, mostly of children), if cattle eat the roots the result can be fatal. 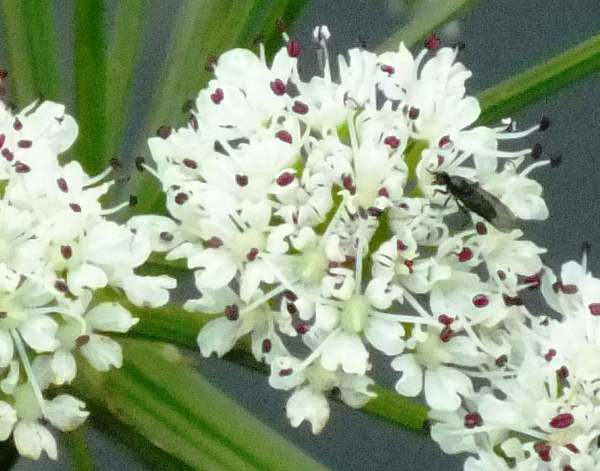 Flowers are white and typically 2mm across and are borne in umbels 5 to 10cm in diameter. The leaves are 3- to 4-pinnate with toothed, wedge-shaped lobes. 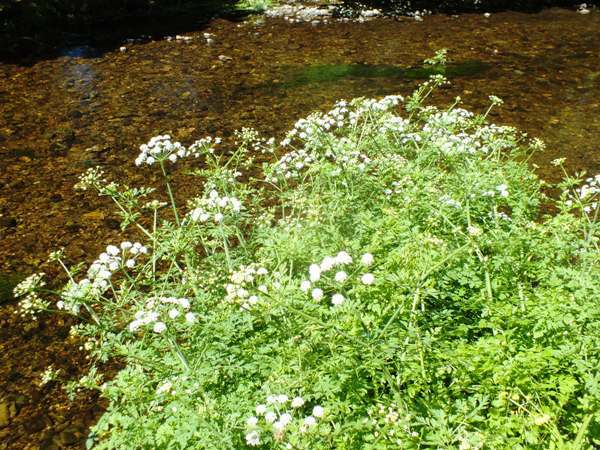 Hemlock Water-dropwort is widespread but only locally common in Britain and Ireland. The genus name Oenanthe comes from the Greek oinis meaning wine and anthos meaning flower, implying that the scent of the flower is like wine (or perhaps suggesting that the smell makes one feel giddy as if from drinking too much wine!) Less contentious, the specific epithet crocata means like a crocus, which may be a reference to the yellow colour of the seeds of this umbellifer. The common name comes from the fact that the tuberous root is connected to the main plant by only a relatively thin linking fibre. The pictures shown on this page were taken in Ireland, France and West Wales in June and July.